Welcome, Readers! 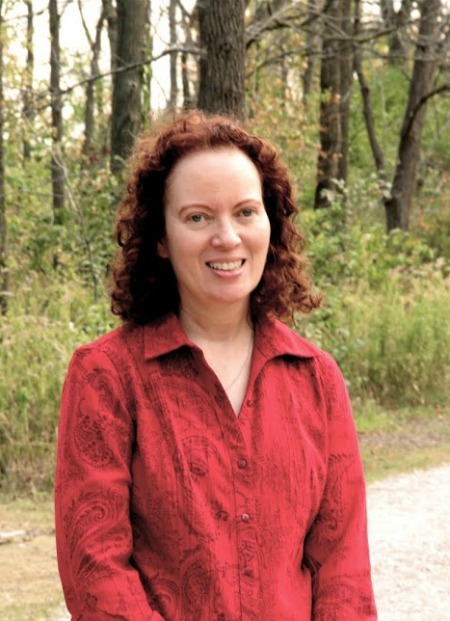 Welcome, Elaine Stock! 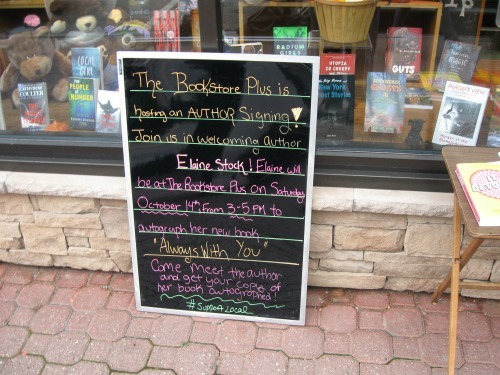 This week we welcome Elaine Stock, an author who fuses romance, family drama, and faith in a clean fiction style. Now that I think of it, I haven’t met a single person who grew up in Brooklyn, which takes me back to that achingly beautiful A Tree Grows in Brooklyn. 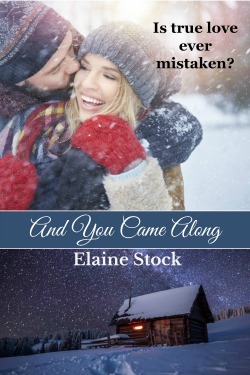 Suddenly, I can’t wait for you to meet Elaine, author of also beautiful Always With You and soon-to-be-released novella, And You Came Along. My pre-author life began with my childhood days growing up in Brooklyn, New York. (Click to Tweet!) 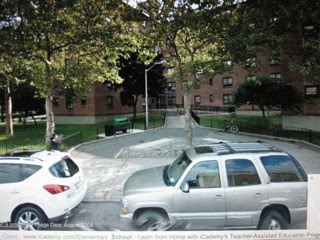 First, in the tenement apartments of East NY then in the Flatbush section and finally in the suburbs north of the city. Not to date myself, but those early years were during the US civil rights movement. I lived with many people from varying faiths, nationalities, and backgrounds. Notably, I believe this was instrumental in teaching me first-hand about the differences and similarities in people. We are all human beings and we all must respect each other, an even more valuable lesson. 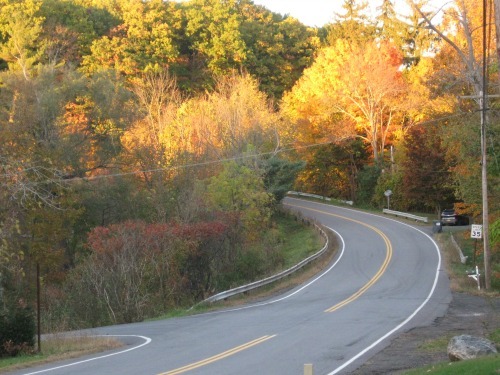 Athough these neighborhoods progressively worsened in crime and danger, the reason why my parents relocated, they were invaluable opportunities to learn life lessons. I see a direct correlation between my past and my “author themes” of tolerance, different kinds of prejudice, forgiveness, and the role of faith. Above, a contemporary photo of my old apartment building. I lived on the 4th floor, facing the street. Subsequently, God had a very interesting role in my life, considering I wasn’t born into a faith-practicing family. My family also was torn apart by mental illness and the stresses of a one-parent income from a 7-day a week business. Perhaps that’s why my early memories were of me searching for a bigger-than-me Ruler of the Universe who loved me for who I was. Then my search took me into my high school years when, through literature and the arts, I became exposed to Christianity. Not until I met and married my first and only true love during my college years did I actively seek to become a Christian. I’m forever saying that if it weren’t for my Father holding my hand I’d never be brave enough to get out of bed and face the world. First, my debut book was Always With You. The story of Isabelle and Tyler’s confrontation of the evil of hatred and its threat to people, love, and faith, began to brew in mind after a writing workshop. However, I didn’t start putting words to the page until after the 9-11 attacks when. Like many, I tried even harder to understand the why behind hatred. Yet, Life 101 happened. I became a very active member of my community group fighting a proposed 100-year mining project that threatened to remove 2 prominent hills only thousands of feet away from my doorstep. Praise God, we citizens won on the supreme court level of the state. But then, Life 101 struck again and I needed outside employment (from my husband’s business). This took a heavy toll of adjustment. Finally, but slowly, I finished my novel and then learned the many lessons of editing. Subsequently, I published two short stories and hooked up with my amazing agent Linda S. Glaz of Hardline Literary. I received a call from the publisher of Elk Lake Publishing who believed in the story and wanted others to read it. The moral of my story: If you want to achieve something, with God’s grace and your fixed determination, you will! On the left, the south hill proposed for mining. This photo was taken from my doorstep. What’s Up With Elaine Stock Now? What’s up with me now? I have a romance series under consideration at a publishing house. 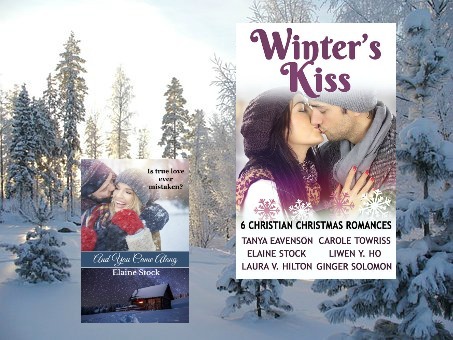 And I accepted an invitation to write a romance novella, And You Came Along, as part of the Winter’s Kiss novella collection. I’m excited to be releasing my novella, And You Came Along, individually on December 2nd. Jacey heads south. Zander heads north. In the middle of a blizzard, five days before Christmas, they collide and wreck their vehicles, and nearly each other, on an ice-covered road. The kindness of two strangers provides a cabin for shelter, a place where pain is soothed and hope is renewed . . . until their pasts catch up to their present and a forever separation threatens. Is true love ever mistaken? Lord, how amazing! You bring together Your children from different backgrounds and locales to communicate Your message. Elaine’s life story demonstrates this vividly. Thank you for plucking her up from Brooklyn and leading her to write clean stories of love, family drama, and faith. Please bless each word Elaine writes for You. Elaine, what a great post. I loved reading this. I’m so happy for you as an author. I have so enjoyed your stories so far and I know God will direct your life for His glory. Kay, you’ve blessed me with your kind words and support through the years. I’m glad we’ve met. Thanks for visiting us. How encouraging, Kay! Please stop by again. Elaine, I’m looking forward to reading your new book! Thanks, AnnaLee!! I hope Jacey and Zander’s story brightens your heart. Thanks for your visit to Linda’s blog. So glad to welcome you to our chat circle, AnnaLee. Please come again. I’m intrigued by your work, Elaine. My roots are in New York and both of my parents grew up in Brooklyn. God bless you as you continue to write for Him. Hi, Penny. What lovely words to hear/read. Thank you. It’s been many years since I’ve lived in NYC, and although I’ve come to love country life, there’s a huge chunk of me that’s distinctly city. LOL. I hope the good part! And You Came Along will release December 2nd, plus I have a family drama stand-alone novel, Her Good Girl, coming out in January. Hope you’ll check them out. Blessings right back to you… to all of Linda’s lovely viewers. How wonderful to make the Brooklyn connection with Elaine. Bless you. And come again. Enjoyed the interview. She would be a new author for me. Thank you formthe giveaway opportunity. Perrianne, I hope you will have the opportunity to read and enjoy me stories. If you do, please let me know. I’d love to hear from you. Hi and welcome, Perrianne! You’re entered in the drawing! Blessings! Thank you for the interview w/ Elaine. It was good to read her background and how she came to faith in Christ. Look forward to reading her newest book. Anne, thanks for your visit. My background was definitely instrumental in leading me to God, as well as shaping the type of stories I write. Lately, I’ve stopped wondering why certain things have happened–or not happened–in my life and have been choosing to praise my Father instead. Wondering drains; praising invigorates! Wonderful, seeing you in our circle this week, Anne. Join us every Wednesday by signing up at https://www.lindabrooksdavis.com. Blessings! Linda, fresh home from the new day job, I’m here now at your lovely blog. Thanks so much for hosting me. The feature is wonderful!! I’m excited to meet your viewers! These look like interesting stories. I’ll be looking forward to them. Thanksfor the interview and reviews. Hi, Paula. Welcome. And thanks for adding to the conversation. I hope you’ll be able to read Elaine’s stories. God bless you! Paula, thanks for visiting today. I hope you’ll have a chance to read my stories and enjoy them. I’ll love to know what you think. Hi, Lucy. It’s so great to see you here and to have you a part of the chat. God bless you! Wonderful interview with Elaine. I love her writing and feel blessed to count her as a FB friend. Hi, Ann, my ever-so-faithful follower and friend. How I love seeing you in our circle. Thank you for sharing your enjoyment of Elaine’s books. God bless you! Ann, I’m delighted to see you here, my friend. I’m fortunate to have gotten to know you through the years and considering how much Christian fiction you read, am honored, truly, that you’ve enjoyed my stories. I enjoyed Elaine’s book, “Always With You”. I need to get “And You Came Along” and read it. Elaine and I have messaged back and forth, but someday I hope to meet up in person and discuss writing! 🙂 Well … we can talk about other things, but thoughts about writing stories would be the most important. Ha. Hi, Karen. 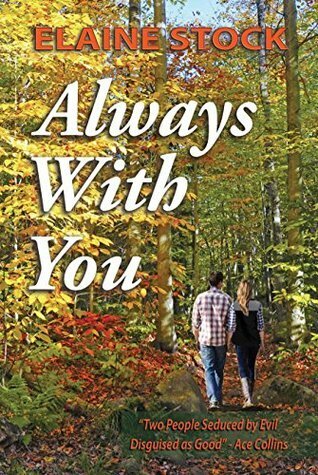 It’s great to hear from a reader how enjoyable Elaine’s “Always With You” is. I hope you do get to meet Elaine in person one day. Thanks for joining our conversation. God bless you! Karen, I’m so touched to see you here, and that you enjoyed Always With You. I hope you’ll also like Jacey and Zander’s story. I must meet with you, and a handful of other wonderful people… we need to have a friends-get-together where we can gather for coffee and chat about writing, books, and whatever else comes to mind. Sooner than later, I hope! Welcome, Elaine to Linda Brooks Davis Storyteller blog. I’ve had the honor of meeting Elaine in 2016. She’s a beautiful Christian and friend. Always With You is a true to life family drama, romance and faith interwoven with realistic characters. A novel that readers will connect with societal issues today. The recent released novella, And You Came Along, in the box set Winter’s Kiss is a delightful tale to read. I’m glad to see it’ll be released individually in December. Thank you for featuring Elaine, Linda. Blessings to both of you as you continue writing bringing the Christian message to life through amazing books. I know you’re blessed to know Elaine personally, Marilyn. Thanks so much for sharing your knowledge of her with us. God bless you! Marilyn, thanks for your visit. God certainly knew what He was doing when He brought the two of us together… like the ACFW conference when I had the thrill of watching Linda win her Carol Award and He bringing me here to her lovely blog! !